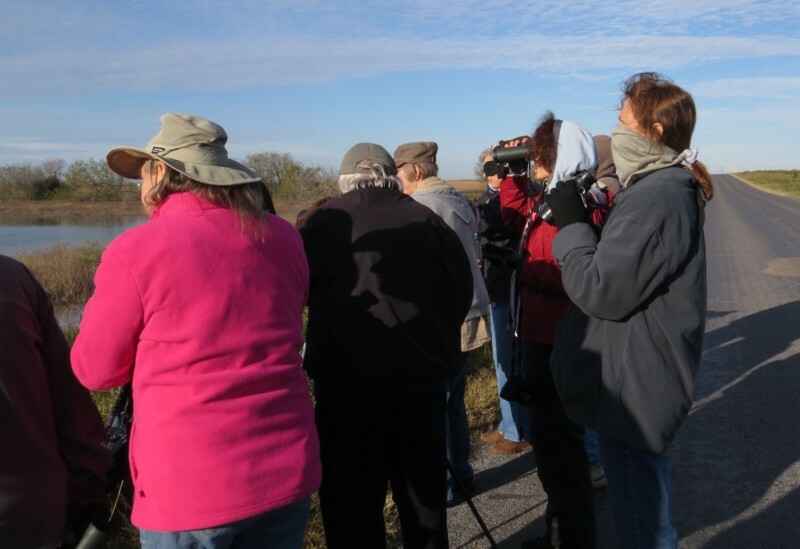 January 24, 2015 - Birder Patrol "Wild Goose & Rarity Chase"
We had a great turnout for our first Birder Patrol trip of the year: the "Western Contingent" met at the Flying J in Edinburg, the "Eastern Contingent" met in Harlingen, and we met in the middle in Edcouch! Norma led the way, as her Arroyo Colorado Audubon (ACAS) group had had some good birds a couple of weeks back on their field trip, so we headed up FM 1015 in hopes of catching a morning flight of geese and cranes coming off Delta Lake (click here for pictures from that Birder Patrol trip a couple of years ago)! It was an absolutely gorgeous day, and we pulled over to enjoy White-tailed Kite, a preening American Pipit, beautiful White-tailed Hawks, and our first vagrant of the day, a male "Northern" Mallard (yes, they're rare down here)! Unfortunately there wasn't a goose or crane to be found (we did see a few Sandhills flying over the road), so either we missed the takeoff or they weren't roosting at Delta Lake this year. Male Mallard in the sun, rather rare down here. We arrived at the little pond "behind" Delta Lake, which is always worth a stop, and after we all wheeled in Cheryle Beck announced that she had a Long-tailed Duck! Someone else said, "Are you lying??" 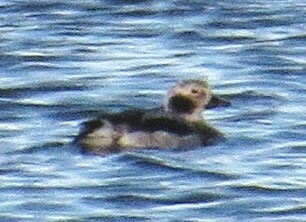 (One had been found in Laguna Vista so they undoubtedly thought she was teasing...) But sure enough, there really was a lady Long-tailed Duck out there amongst the Gadwall, Coots, and other duckies! 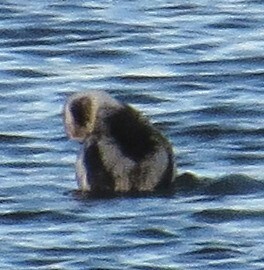 She would sit up in the water and kind of waggle around before preening - what a showoff! 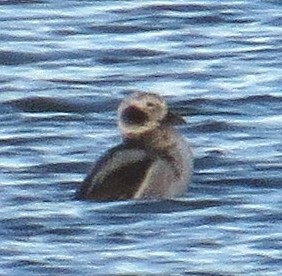 ☺ That was a lifer for some folks, and a total surprise - she certainly made up for the lack of geese! Another nice surprise was a Least Bittern cackling from the reeds, as they usually vamoose the joint in the winter! 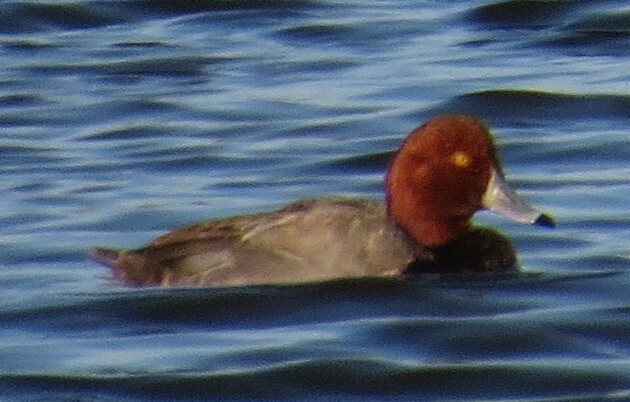 Among the other ducks was a male Redhead, which was nice, as they can be rather scarce inland. 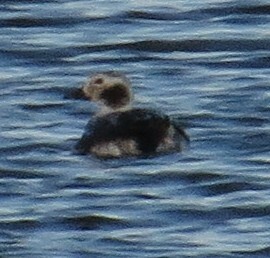 Female Long-tailed Duck at the FM 1015 Pond; this is an arctic duck that normally gets no further south than the Carolinas in winter, but it can show up anywhere in the country as a vagrant! 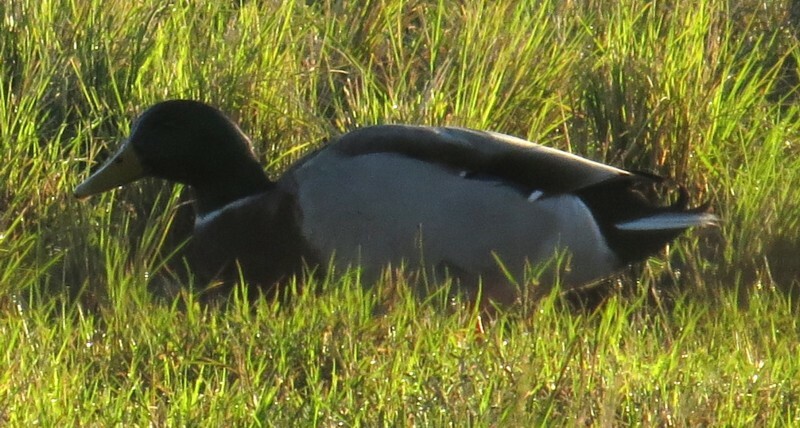 Redhead, much more common on the coast than inland. When we hit FM 490 we went west, and there were all sorts of wet spots left over from the rains; it was along here that Norma's group had an American Bittern on their ACAS trip. She found the particular wetland, and we did manage to add some nice birds: several kinds of herons, calling Marsh Wrens and Yellowthroats, a whinnying Sora, and at one point a brown bird exploded from the reeds that we all thought was Norma's bittern at first, but the uniform-colored, rounded wings and stocky bill tagged it as a young Black-crowned Night Heron (we found an adult later for good measure). Baceliza reeeely wanted to see Sandhill Cranes on the ground, and closer to Hargill we actually spotted a group and stopped to enjoy them; we had some very happy campers at that point! ☺ There were also a few Bobwhite that scattered about and one that sat stoically on a piece of corrugated tin! The original plan was to head up into La Sal del Rey to search for some Hooded Mergansers seen a couple of weeks back, but the majority wanted to try for the Mountain Plovers over by McCook, so we continued west on 490 past the freeway, but just before McCook Norma had us stop near a grassy area, as they had had Sprague's Pipit there on their trip. 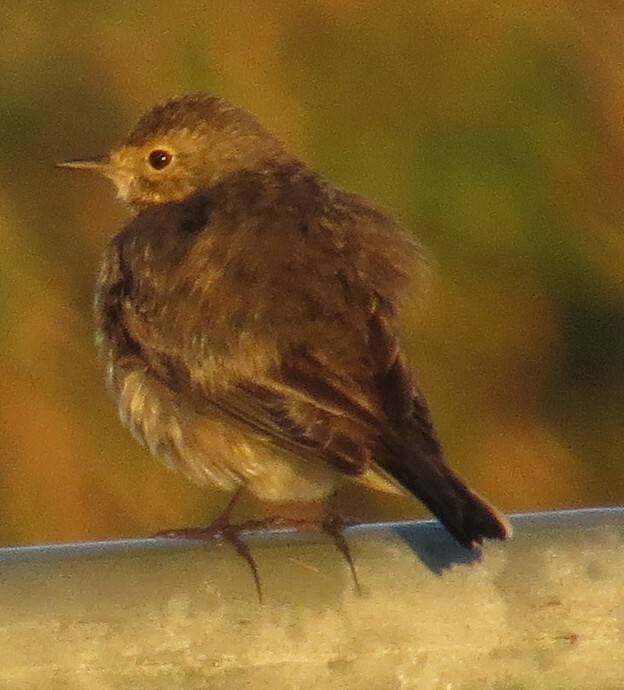 We looked around for a few minutes, not seeing or hearing anything but a Pyrrhuloxia on the wire and a "glowing" Brown-headed Cowbird, but as the caravan rolled away Baceliza (in the last car, of course) spotted something that looked like a miniature Upland Sandpiper, which we concluded was probably the pipit! 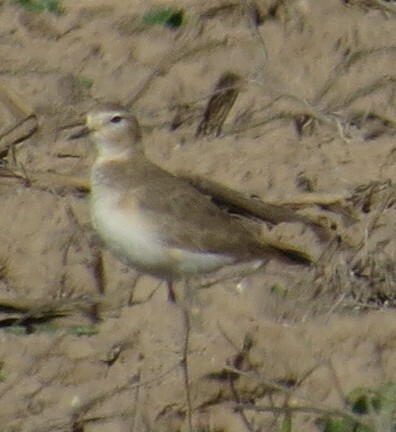 We then rolled down to the area where Norma had seen the plovers and started scouring the pigeon flock in the field when someone mentioned that Dan Jones had had the birds along Jara Cintas, closer to the treeline. So we headed down that way, and seeing a couple other birders down the way, our car zipped down there to find Bob Becker and Bert Wessling, who had the plovers in view (and fairly close at that)! 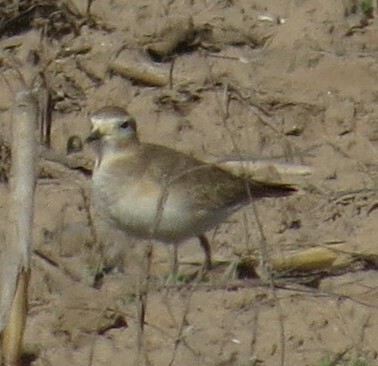 Didn't take long for the rest of the cars to catch up, and we all had wonderful looks at these rare plovers! The guys thought they might have seen the Prairie Falcon earlier, but it was a quick look in terrible light, and alas, we never did spot that or the Ferruginous Hawk (although we had a pale immature Redtail). After everyone had had satisfying views of the plovers, we combed the roads a bit looking for raptors and pipits, and found a little pond with several Ring-necked Ducks in it (several were nonplussed that a pickup pulled right up to the pond long enough to scare the ducks off, then promptly left), but that was about it for the day, until news came over the hotline that a Gray-crowned Yellowthroat had been found at Estero! I had to go home, but Norma's crowd hightailed it over there and thankfully got to see it! All in all it was a great day! Happy campers at the north end of Jara Cintas!